Good landscape design has the power to create a sense of progression, scale and discovery and by cleverly adapting the design vocabulary to its immediate vernacular a tangible authenticity can be created. Architect, Kishore D Pradhan’s masterpieces are born out of exactly such a design ethos. 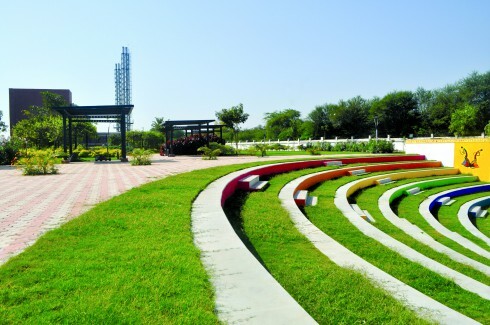 Much of the IT Park’s appeal lies in its profusion of greenery and an evocative landscape design. 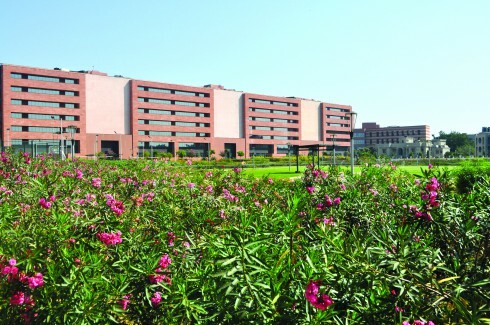 Pradhan has rooted an orderly and cohesive design softening it with apt planting. Landscape Architect, Kishore D Pradhan has been plating up landscapes with fractals and contrasting geometries since decades. His spaces can be lent the wonderful analogue of a prism which when probed, refracts light into various hues that emerge from every facet. 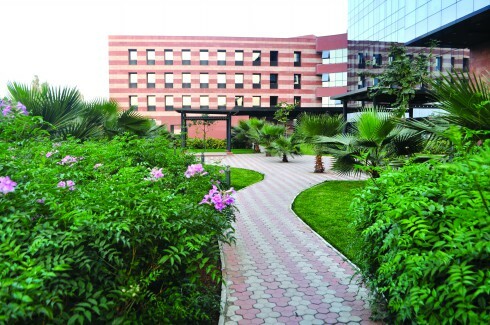 The landscape design executed for Tata Consultancy Services, IT campus at Garima Park, Gandhinagar rests on the pillars of part form and part function, it is a symbol of good design that not only enhances the overall look and image of the IT building but also makes sure that the design elements serve several important functions. 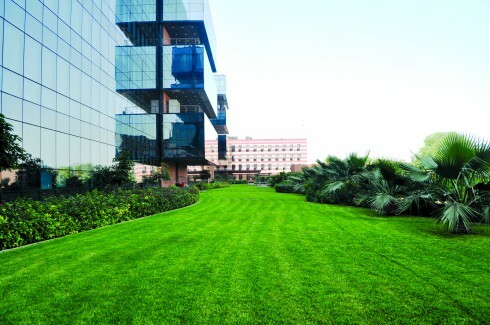 Much of the IT Park’s appeal lies in its profusion of greenery and evocative landscape. 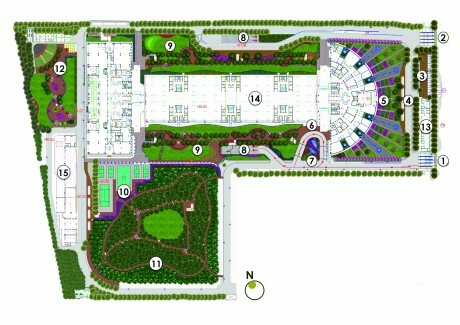 “The 25 acre plot came with a large building footprint of 24,000 sq m,” shares the architect. An elongated site gave the space an axial planning. Sitting atop the basement which extends well beyond the footprint of the building on both the longitudinal sides, the landscape was conceived to achieve both simplicity and flexibility of space. The immediate environs of the building have been developed above this basement slab. A distinctive landscape feature can generate an imaginary line that leads one to connect and hinge the design. The architectural team has very adeptly created such focal areas that have been seamlessly integrated into the landscape design. The amphitheatre in the extreme right corner of the property gently undulates with its split level seating as it blends into the rest of the space with the help of the paved pathway that surrounds it. The very minimal hard paved areas use paver blocks in driveways and pathways bringing to the forefront a very cost effective finish that also creates a strong visual impact. Dotted by pergolas, the large expanse of space is brought together at these junctures for more intimate gatherings. A water feature on the extreme left of the property ripples up a different setting welcoming employees to throng to it during sublimely lit-up evenings. The amphitheatre in the extreme right corner of the property gently undulates with its split level seating, even as it blends into the rest of the space with the help of the paved pathway that surrounds it. While creepers prop up shady corners, they once again remind us of the fact that urban landscapes can bring us together and spread us out. 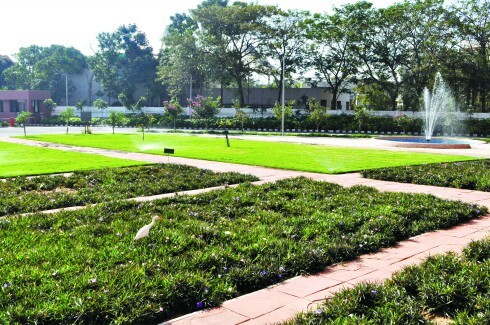 Pradhan shares, “Efficient usability of outdoor spaces, takes human intervention as close to nature as possible.” Shrubs border manicured lawns, pronouncing concrete patterns that lend texture to the design deployed to the wide open ground. The whole plot comes across with two evident sides – a calm side that reflects the stone building façade in its expanse of glass walls and ribbon windows and a more dynamic side which is represented by the landscaped area that surrounds. People have a misconception that landscape means planting trees around buildings. Landscape architecture deals with the total outdoor environment with the understanding that the components of nature – earth and water are interdependent. This is clearly visible in Pradhan’s beautifully designed and executed piece of work. 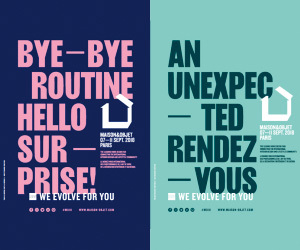 The landscape renders spatial continuity as it follows the typography that has been used by the architectural team. It is entirely in sync with the built environment and has served to create tranquil spaces even as it complements the architecture that surrounds and defines it.